During the Civil War, looting by soldiers was a common practice. The hungry soldier usually confiscated food and livestock, but sometimes he carried off personal items, such as books. The Society has a small collection of books "captured by Union soldiers from behind Confederate lines and carried off to "freedom." 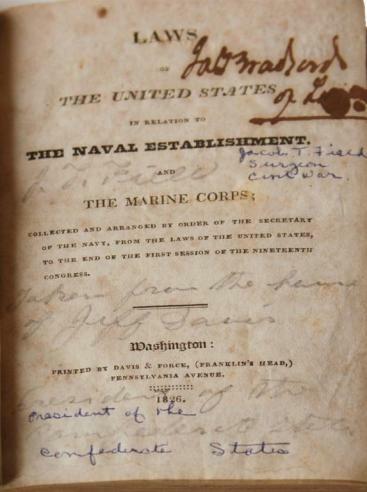 The liberators often documented their actions with an inscription in the book, while later owners recorded the process of returning these volumes to the South. One recently donated book, The Laws of the United States in Relation to the Naval Establishment and the Marine Corps (Washington, 1826), bears the inscription "Taken from the house of Jeff Davis, President of the Confederate States, by Jacob T. Field, surgeon." Field was an army surgeon who served with the U.S. Mississippi Squadron. Other liberated volumes in the collection include ones taken from Arlington, Fredericksburg, Warrenton, Chancellorsville, and Yorktown.